Some of the controlled chaos that was Ag Day 2015. 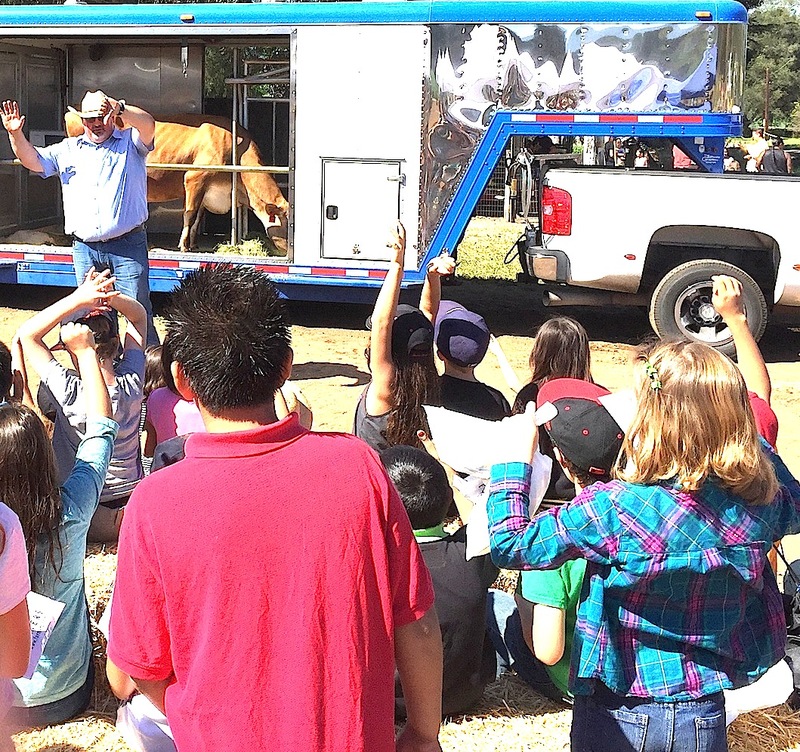 Dairy Council of California showed kids how to milk cows with a mobile dairy classroom. They came. They saw. They trekked like soldiers going off to war, according to recently retired San Diego County entomologist David Kellum. And they learned. Welcome to Ag Day 2015 hosted at the Martin Gang Agricultural Learning Center on Cole Grade Road. 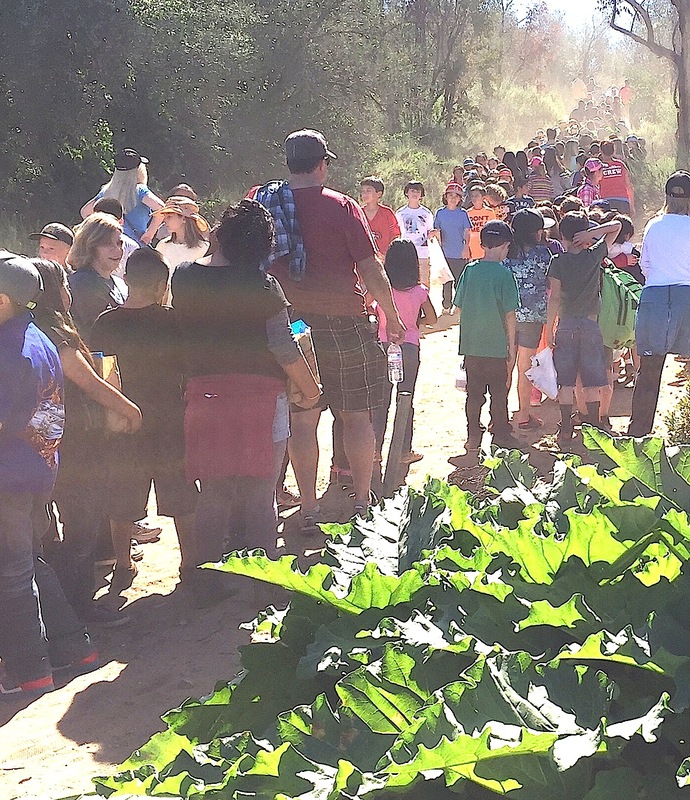 Some 1,700 local kids from the entire Valley Center-Pauma Unified School District elementary school community, and fellow travelers, swarmed like bees across the farm. 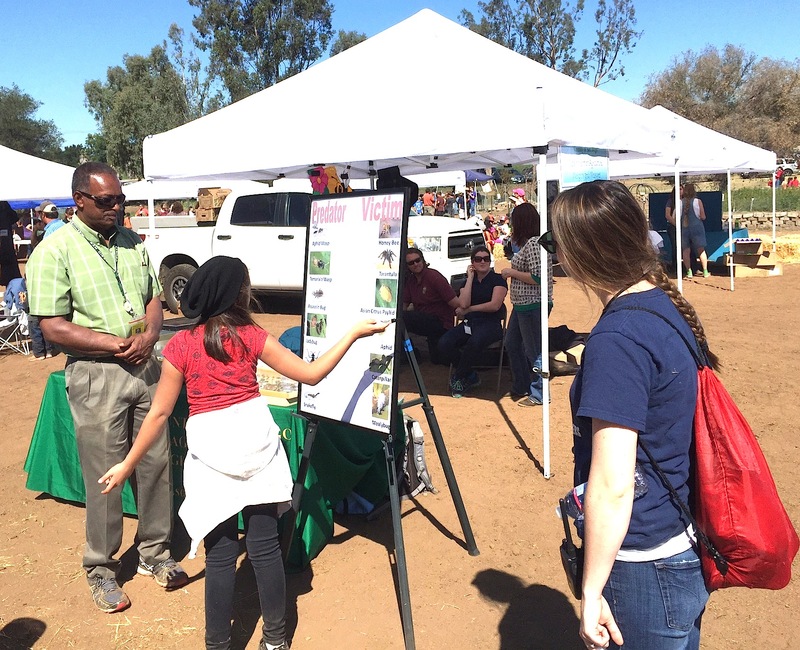 A host of vendors, agricultural concerns and even fellow middle and high schoolers presented exhibits and hands-on demonstrations throughout a sun-drenched Friday, March 20 ay at the farm. When school groups rested, if only for a moment, they broke out picnic lunches brought from home or provided by the district. A lot of the students and fellow travelers not only were on the same page, but offered similar remarks. They each said this was among, if not, their favorite day of the school year. No wonder. Upon further review, make that much wonder. 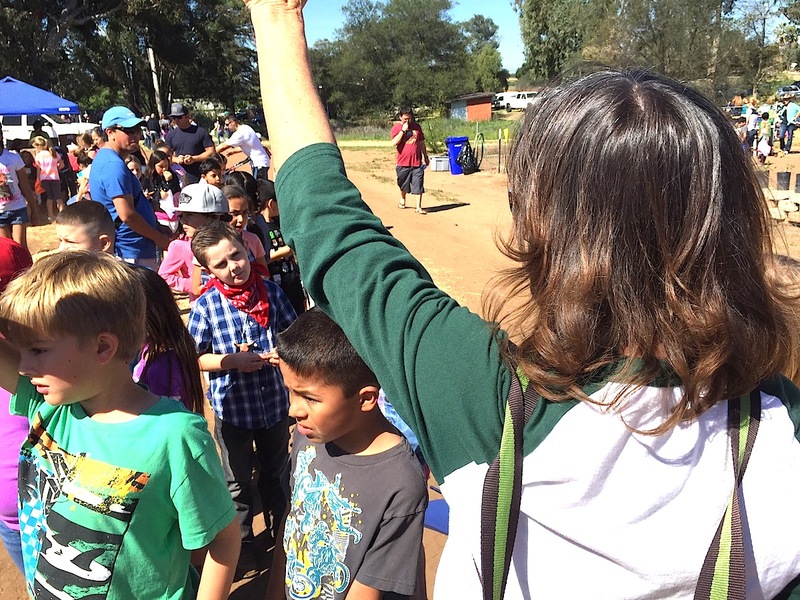 As veteran teacher Kathy Wollman kept eyes front keeping her group of 22 Valley Center Primary second graders on line by the nuts and bees booths, second grader David Manriquez said, “This is a fun day learning about animals and plants,” then smiled. Valley Center Primary teacher Kathy Wollman keeps her second graders, including David Manriquez, under her left arm, in line. How many years has it been for Valley Center Ag Day? Wollman said maybe all her 17 years. District parent, and former Lilac School supervisor Cheri Sabbara said 15 years, adding she has been to every one. Split the difference, the first Ag Day, research revealed, took place in 1999. “I’ve been coming here 15 years to every one and learn something every year,” Sabbara said. “I mean, guava. Did you know is more vitamin C than four or five oranges?” Nope. 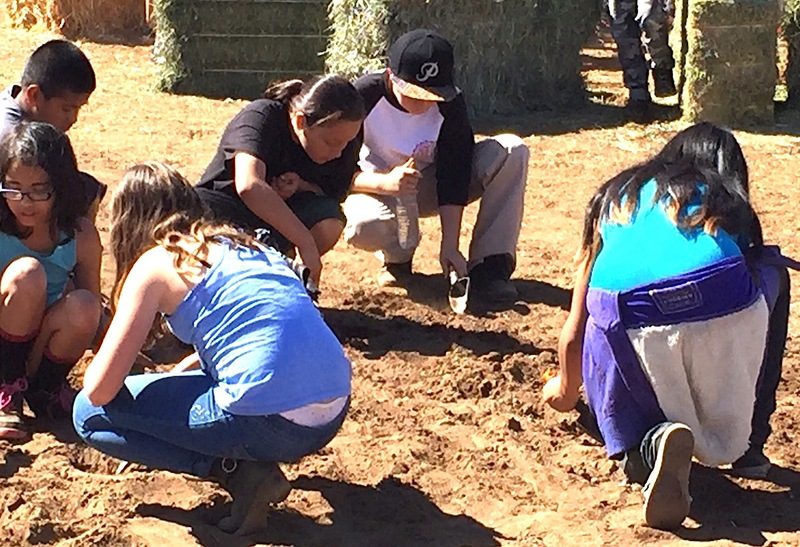 Kids at one corner indeed spent some quality time in the dirt planting spuds while high school students nearby led younger kids through the intricacies of roping. A representative of the Dairy Council of California showed kids how to milk cows with a mobile dairy classroom, milking cow and all. Pigeon racing, pumpkin growing courtesy of Bates Nut Farm, Palomar Health Community Outreach Fuji apple growing, nutritional and veggie booths dotted the farming landscape. to name but a few of the dozens of exhibits. Then there was Kellum, a longtime San Diego County Agriculture leader and Valley Center resident now doing consulting work with farmers on bees and fire ants, leading a very hands-on look at insects. Kids came around his poster boards and exhibit identifying good and bad insects. Spoiler alert: Most insects actually are good. “Entomologists know most insects are good,” Kellum said. “Spiders and tarantulas are not insects. Kids pick up fears from their parents. I do this so kids aren’t afraid of the insects. Long lines of students, arranged by class, trooped around the learning center through early afternoon before departing to their appointed places to finish the school day. And off they went, into the distance and dust, another Ag Day done. Students head back to class, looking like an army, some said.